IfÂ a Ning Network is invitation only, you have to receive an email invitation from a member before you can join. You can recognizeÂ these networks by the Sign In page youâ€™ll see instead of the Main Page when visiting. There will be a message statingÂ that you need an invitation to join. To get an invitation, youâ€™ll need to contact a member of the Ning Network. 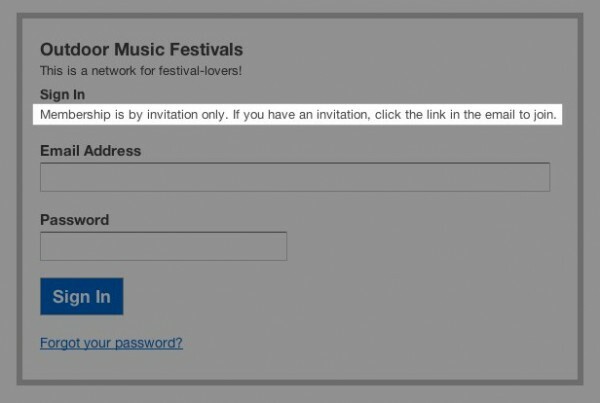 Any member can send you an invitation via the Invite page â€“ you donâ€™t necessarily need to contact an administrator or the Network Creator. Once a member has sent you an invitation, youâ€™ll receive an email with an invitation link. Be sure that when you click this link, youâ€™re ready to fill out your profile information and finish joining before doing anything else. If you donâ€™t finish signing up in one session, or if you navigate to another web page while signing up, your invitation will expire and youâ€™ll need a new one.